White River Kayaking is one of the best outdoors in Branson where you can enjoy your vacation with their fun-filled kayaking adventures. Located just a few blocks away from Branson Landing and Lake Taneycomo, White River Kayaking has several launch locations where you will be picked up and drop off at the end of your float. They offer services on Lake Taneycomo, Table Rock Lake and Bull Shoals Lake. In 2013, White River Kayaking & Outdoors started to offer bike rentals. Around the area where White River Kayaking & Outdoors is located, you will feel a cooler temperatures while waiting for the water levels to rise to start a decent float. Spring season is a great time to take a fun kayaking adventure on spring-fed rivers like Lake Taneycomo as you don’t have to paddle hard while cruising with the current. The current will really make your floating on the river a wonderful ride. If you really want to enjoy the outdoors, try a kayak adventure where you will appreciate nature and the beauty it has to offer. When you are kayaking near the base of Table Rock Dam, the current is enough to experience a nice float on a single access kayak. This gives any kayak rider a good chance for viewing a variety of fish in the clear waters. If the river doesn’t provide enough fun and excitement for you, try to dip in a 48 degree water. You will feel that when your face hits the water, you definitely rush out from it for fear of freezing. But it’s fun to watch some of your friends jumping out of the water and rushing to get off. White River Kayaking & Outdoors in Branson is such a wonderful place to spend a great kayak adventure on any of the pristine waters in the Tri-Lakes area. 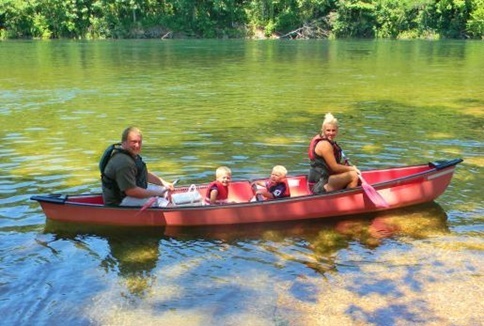 Their kayaks are durable and dependable and they cared about safety and comfort of every adventurer. When you are planning for a wonderful kayak adventure in the area, just keep in mind to plan ahead of time. You need ample time for setting up your kayak adventure where you need to travel to the drop off site for pick up and return at the end of the activity. White River is really a great place to rent a kayak as they always offer excellent service to all kayak riders. The staff are very friendly, courteous and knowledgeable. You will be guided as to what to look out for during your ride and after you are set to go, you start the adventure at your own pace. When you are paddling in Lake Taneycomo, you will feel the cool temperatures of the waters which is a good way to beat the heat especially when you are kayaking during summer season. White River Kayaking & Outdoors is a great place to enjoy a fun-filled kayaking adventures where you will be picked up and drop off at several launch locations.